For more than 10 years, the United States has faced serious environmental challenges in the form of flooding caused by hurricanes. It has led to wanton destruction of lives and properties in various degrees. This is in addition to the almost yearly fire outbreaks that ravage the southwestern part of the country. In California, these fires result in burning down the forests and distorting the ecosystem. Emission of carbon into the atmosphere, in particular, is also immeasurable. Policymakers, commentators, scientists and other stakeholders have deduced many objective factors as the causes of these disasters. One of these is a “tropical depression” of the Atlantic Ocean. 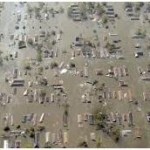 The National Oceanic and Atmospheric Administration (NOAA) attributed the cause of Hurricane Katrina in 2005 to a tropical depression. Hurricane Katrina, described as the deadliest in America’s history, killed 1,833 people while millions of others were rendered homeless. The economy was reported to have lost a whopping $108 billion to this tornado. The windstorm was ranked sixth-strongest among recorded hurricanes in the Atlantic. Farmlands, residential and commercial properties were destroyed particularly in Florida and New Orleans. In 2012, Hurricane Sandy hit the U.S. and impacted neighboring territories and countries like Jamaica, Canada, Cuba, Dominican Republic, Haiti, Puerto Rico and the Bahamas. In the U.S., 24 states were affected included New Jersey, New York, Florida, Maine, Michigan and Wisconsin, among others. Hurricane Sandy flooded streets, tunnels and subway lines, causing distortions to the socio-economic life and bringing everything to a standstill. Public infrastructures were damaged. Homes and other property were destroyed. An estimated $71.4 billion was lost due to the disaster. Community intervention toward restoring general order should bring together all means of achieving this purpose. To achieve total equilibrium, legislative and legal, social, institutional and infrastructural measures have to be put in place. Community intervention should be aimed at resettling the society and preventing damages that might be caused by future disasters (since we cannot stop the occurrence of catastrophes). However, there should also be community participation. There should be a flow of information between relevant government and academic research institutions and the affected people. Regular sensitization and educating programs should be organized to educate people through workshops, seminars and the media. People should be enlightened about the course of actions to be taken as soon as they see a disaster on the horizon. Individuals should also communicate regularly among themselves to share information by setting up community-based organizations (CBOs) and Community Development Associations (CDAs). Interaction among community members should also be strengthened. Certain days of the month should be set aside for regular environmental sanitation exercises. This will help prepare the community because it will serve as an avenue to mobilize popular participation against disasters. Author: Adesanya Omoniyi ADEKOYA is a doctoral student of public policy analysis at Walden University. Adekoya can be contacted via [email protected].